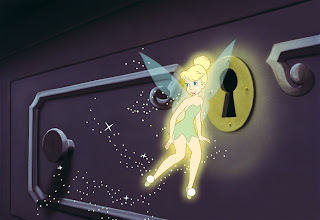 You know this movie makes for a very interesting review for several reasons...Ever since I can remember, Dane has had a thing for Tinkerbell - yes girlie but she can be perceived as a pretty hot cartoon too :). Its actually been nice though for Alana and I because it has been one of those movies we actually don't mind watching with him. Oddly enough we hadn't introduced him to the actual movie Peter Pan until now (and he's about to turn 5). When we started hanging out with Amy and her daughters this past summer, it was almost perfect because both of her girls were very into Peter Pan as well as Jake and the Neverland Pirates. We've actually joked several time as parents how funny it is that our oldest children have almost switched stereotypes. Dane likes the girlie things and Mikayla loved the boy things. 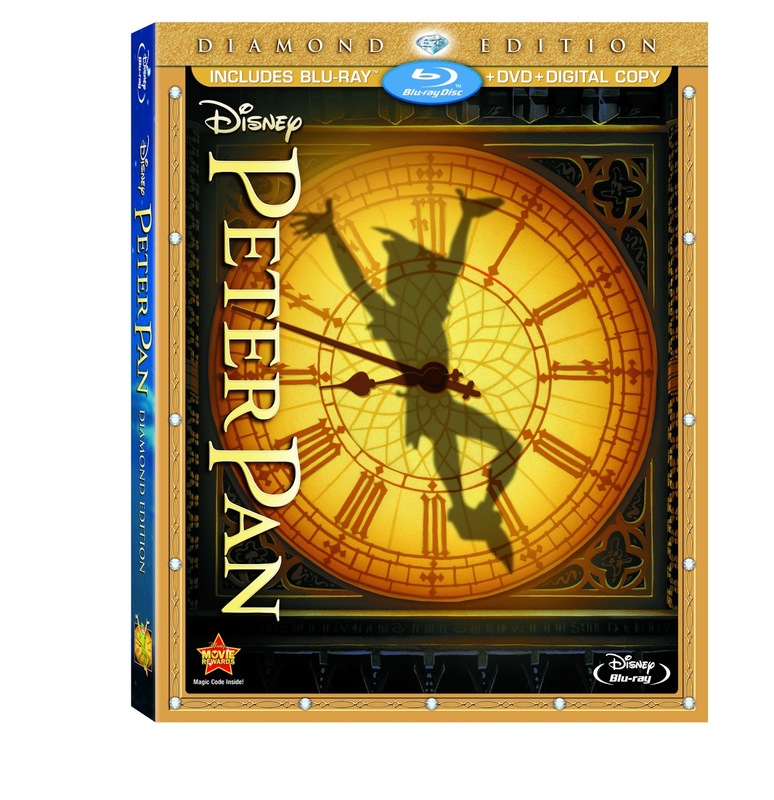 For those of you who haven't yet seen the movie, the synopsis says "The classic tale that taught us all “to believe” and first introduced us to the Darling children – Wendy, John and Michael - as they flew with Peter Pan and Tinker Bell past the second star to the right and straight on ‘till morning to the enchanted world of Never Land. Rediscover the magical adventure and relive childhood memories of this great bedtime story. " 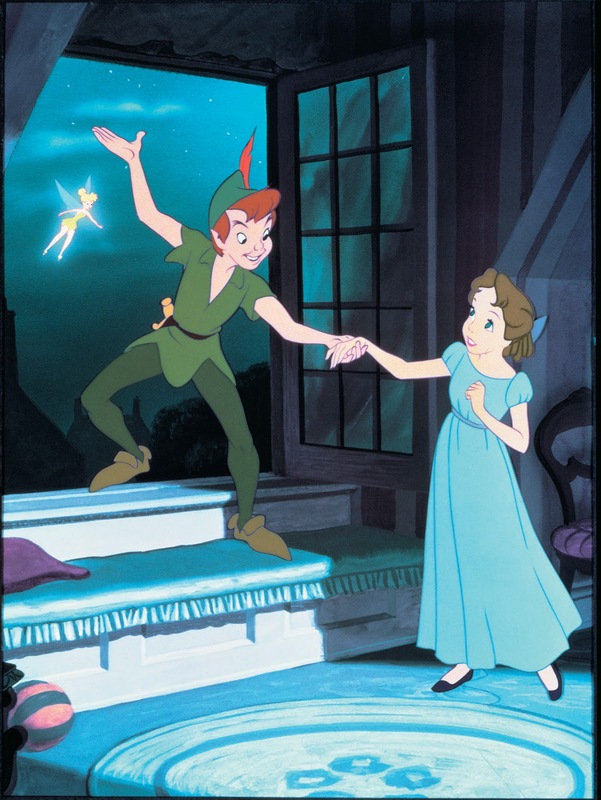 On February 5th, Disney celebrated the 60th Anniversary release of PETER PAN. The movie has been digitally restored and is now available in high definition for the first time on Blu-ray! This release is available on Blu-ray, DVD, Digital Copy and includes a Storybook App and several bonus features such as the Disney Intermission, Growing up with Nine Old Men short film, never-before-seen Deleted Scenes and a never-before-heard Deleted Song and more! We were all very excited to watch the newly rereleased Peter Pan and each of the four children were into it for different reasons. This definitely made for a great movie!! Does you family need a break? Take your family to Never Land this weekend. Think happy thoughts, add a pinch of fairy dust and check out the Peter Pan Family Weekend activities below! Build a family fort hideout out of old wood and cardboard boxes! Then, relax with Peter Pan Snacks, sip Tinker Bell's Perfect Pixie Nectar while munching on Captain Hook's Honey Oat Plank Snacks. Recommendation: We all loved this classic tale and both boys have enjoyed watching a new and exciting part of Tinkerbell. I think the colors are great for the lil ones and the lessons are great for any age! 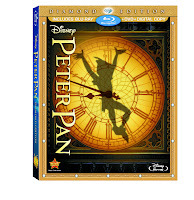 Bonus Features: Disney Intermission (new), Growing up with Nine Old Men (new), Disney View (new), Introduction by Diane Disney Miller (new), Deleted Songs & Scenes , You Can Fly: The Making of Peter Pan, Tinker Bell: A Fairy’s Tale, Disney Song Selections, Audio Commentary Hosted by Roy Disney, Music Videos & More! Treat the Lost Boys and the rest of his carefree crew to a party, of course! Set sail for an afternoon of adventure with Pirate Ship Pizza, treat everyone to part of the loot with Peter Pan Grab Bags and keep the fun going with Character Coloring Pages! These Peter Pan Party Kit activities are sure to have everyone feeling like part of Peter's inner circle! Yep Randi, we were so excited to learn this classic was coming out of the vault. We've picked up our copy for the girls and I'm happy that I might be able to find Peter Pan items since that's what Mikayla wants as her birthday theme. 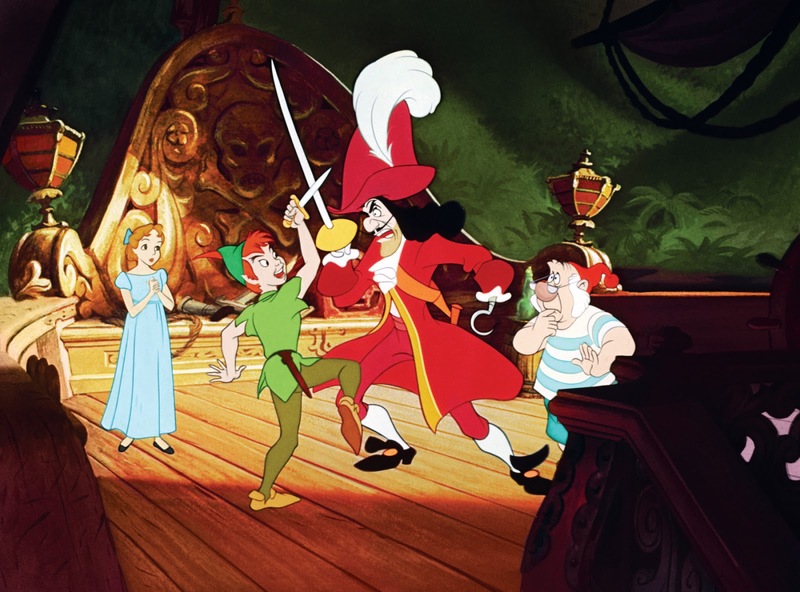 Peter Pan is one of my favorite movies! I use to watch it all the time when I was a little girl. I am excited that it is coming out of the vault so I can buy this for my two little girls.